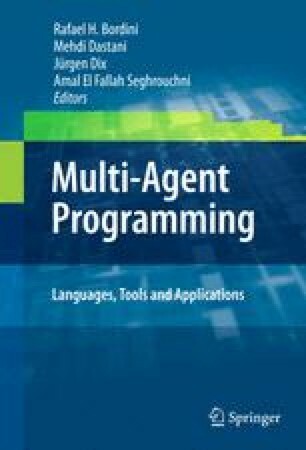 The agent programming language GOAL is a high-level programming language to program rational agents that derive their choice of action from their beliefsand goals. The language provides the basic building blocks to design and implementrationalagents by meansofa setofprogramming constructs. These programming constructs allow and facilitate the manipulation of an agent’sbeliefs and goals and to structure its decision-making. GOAL agents are called rational because they satisfy a numberof basic rationality constraints and because they decide to perform actions to further their goals based uponareasoning scheme derived from practical reasoning. The programming concepts of belief and goal incorporated into GOAL provide the basis for this form of reasoning and are similarto their common sense counterparts used everyday to explain the actions that we perform. In addition, GOAL provides the means for agents to focus their attention on specic goals and to communicate at the knowledge level. This provides an intuitive basis for writing high-level agent programs. At the same time these concepts and programming constructs have a well-dened, formal semantics. The formal semantics provides the basis for deninga verication framework for GOAL for verifying and reasoning about GOAL agents whichis similar to some of the wellknownagent logics introduced in the literature. I would like to than keveryone whohas contributed to the development of GOAL, by helping to implement the language, developing the theoretical foundations, or contributing to extensionsof GOAL. The listof people who have been involved one way or the other in the GOAL story so far,all of which I would like to thank are: Lăacrăamioaria Aşstefăanoaei, FrankdeBoer, MehdiDastani,Wiebe van der Hoek, Catholijn Jonker, John-Jules Ch.Meyer, Peter Novak, M. Birna van Riemsdijk, Tijmen Roberti, Nick Tinnemeier, Wouter de Vries. Special thanks go to Paul Harrenstein, who suggestedthe acronym GOAL to me, and Wouter Pasman, who did most of the programming of the GOAL interpreter. I would also like to thank Hilko Derde for useful remarks that helped to improve this chapter.